Pink and grey geometric nails | Light Your Nails! Today I’m showing you a nail art that I created using H&M Stucco as a base. I’ve swatched that one a few days ago on the blog. Colour combo was an easy choice, I love grey with pink. What I stamped was totally random though. I used my new Harunouta 10 stamping plate and special stamping polish from Bornprettystore in the colour Peachblow. I sealed my mani with my beloved Flash Mat top coat by TNS Cosmetics. Oggi vi mostro una nail art creata con lo smalto H&M Stucco che vi ho mostrato qualche giorno fa. La scelta del colore da abbinare per me è stata semplice: io adoro la combinazione grigio+rosa. Per quanto riguarda il disegno invece ammetto che sono andata un po’ a caso. Ho utilizzato il dischetto da stampa Harunouta 10 e lo smalto speciale da stampa Peachblow, entrambi di Bornprettystore. Infine ho sigillato il tutto col mio amato Flash Mat top coat di TNS Cosmetics. Harunouta 10 stamping plate worked really well as you might see yourself. I picked a pattern that has extremely thin lines and dots and for that reason I used a special stamping polish. I had already reviewed Peachblow sometime ago. I really like the final look, it’s both geometrical and ugly sweater at the same time. Colours make me crazy, plus matte! What do you think of my mani? Do you like it as much as I do? Il dischetto Harunouta 10 si è comportato benissimo come vedete. Le linee del disegno che ho scelto sono davvero fini, e per questo motivo mi sono affidata a uno smalto apposito per stamping, che avevo già recensito sul blog (Peachblow). Il risultato mi piace tantissimo, una via di mezzo tra il geometrico e un maglione di Natale! I colori mi fanno impazzire. E poi è matte! Voi cosa ne pensate di questa nail art? Vi piace quanto a me? I really like sweater looking nails, cute mani! I love the argyle-esk images and your right, they pink and grey color combo is perfect. That turned out really pretty. This looks so cool - I love that you went matte with it! Yes! That plate is amazing! That plate is amazing! I love how your mani turned out! And being matte = SUPER! Bellissima combinazione e stamping impeccabile... complimenti! Wow, love the outcome of this one. It looks flawless! This turned out so good! Your stamping is so clean and yay matte!! 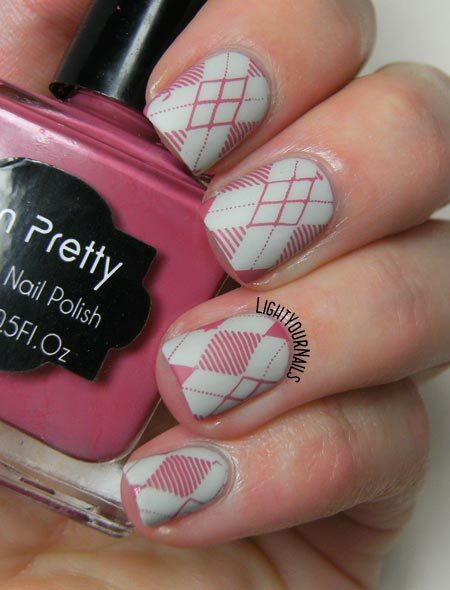 I love argyle nails! You did a great job stamping, look how clean those lines are! Thank you Becca! It reminds me of a jumper, too!